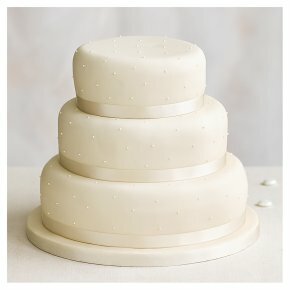 A Fiona Cairns 3-tier chocolate sponge wedding cake with chocolate buttercream covered with soft ivory icing. Hand finished with satin ribbons. INGREDIENTS: sugar, rapeseed oil, free range whole egg, water, fortified wheat flour (wheat flour, calcium carbonate, iron, niacin, thiamin), butter (milk), wheat glucose syrup, cocoa mass, modified maize starch, cocoa powder, fat reduced cocoa powder, salt, buttermilk, palm oil, milk whey powder, emulsifiers (mono- and diglycerides of fatty acids, mono- and diacetyl tartaric acid esters of mono- and diglycerides of fatty acids, propane-1;2-diol esters of fatty acids, sodium stearoyl-2-lactylate), humectant (vegetable glycerine), raising agents (diphosphates, sodium carbonates), wheat gluten, stabiliser (tragacanth), flavouring, colour (caramel syrup), apricot jam (wheat glucose-fructose syrup, apricot, gelling agent (pectin), sugar, citric acid, acidity regulator (sodium citrates)), dried free range egg albumen.